In my last post, I promised an update from "Winter School". Recent study hasn't involved a class, though. 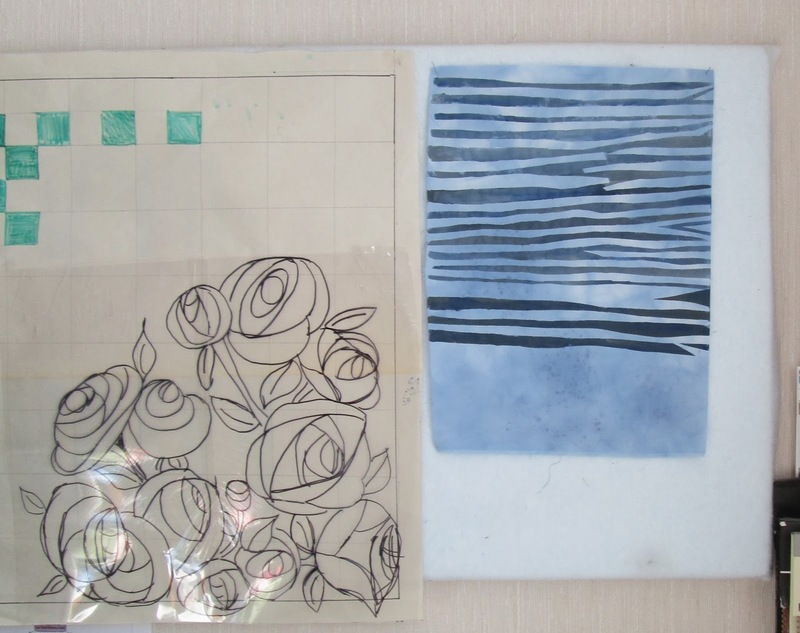 Rather, I've been working through books on Charles Rennie Mackintosh for the piece on roses I'm preparing (scroll down). There are two motifs he favoured that I want to refer to for my work: the Glasgow Rose, which I already mentioned, and the idea of squares/grids/lattices. 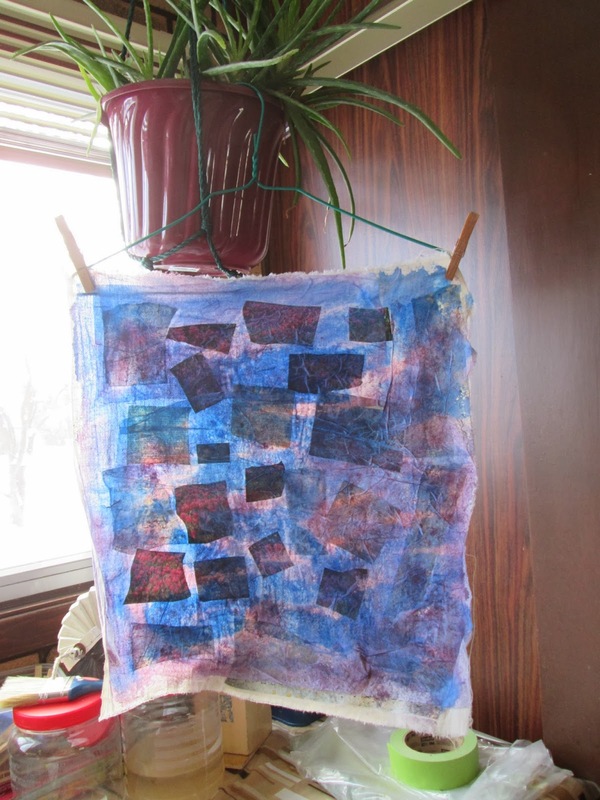 To wit, I've been exploring ways to create grids, including surface design, and the work of Beryl Taylor -- specifically her diamond grid hanging shown in Mixed Media Explorations (QuiltingArts, LLC, 2006). 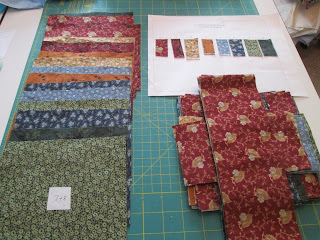 This is a step out on a limb for me, as I far and away favour working with fabric over paper and glue...but in the course of this work, I decided to go ahead and try a couple of samples. It's clipped to a piece of foam core for stability, and sitting on the counter in my south-facing sunny back room, but you get the idea. and (R) painted "A Walk in the Woods II"
Pattern: "Carpenter's Star" -- technique designed by Debbie Maddy of Calico Carriage. The kit contained all the fabric for the top, and the pattern for a 70" square finished piece. 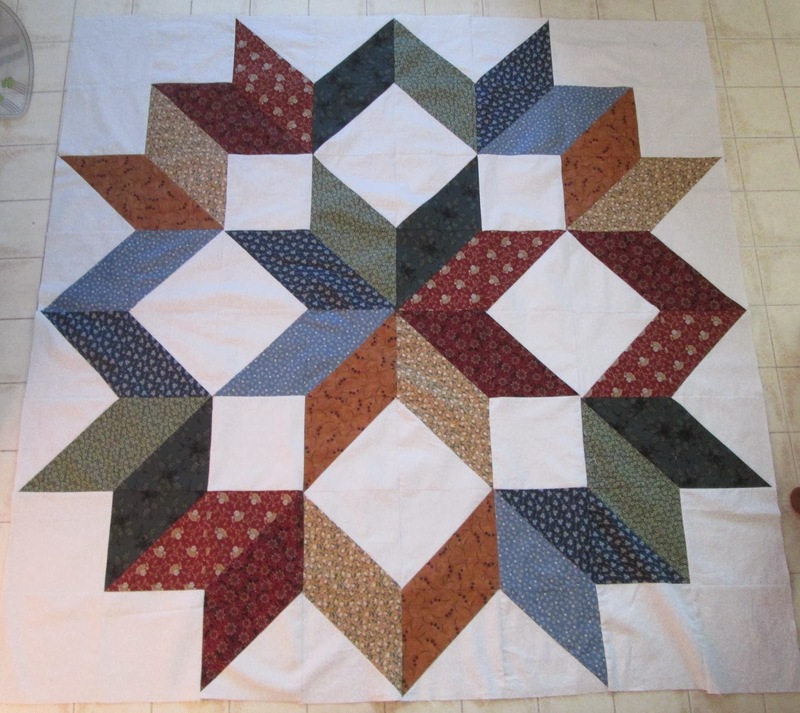 I've gone back to my Craftsy class with Ann Petersen - "Quilting Large Quilts on a Small Machine" -- and will be doing this with her advice and guidance. There are 4 borders to add; all but the outermost are very narrow. She's given me some great options for quilting the central motif and then adding borders in such a way that there's not too much bulk in the seams. 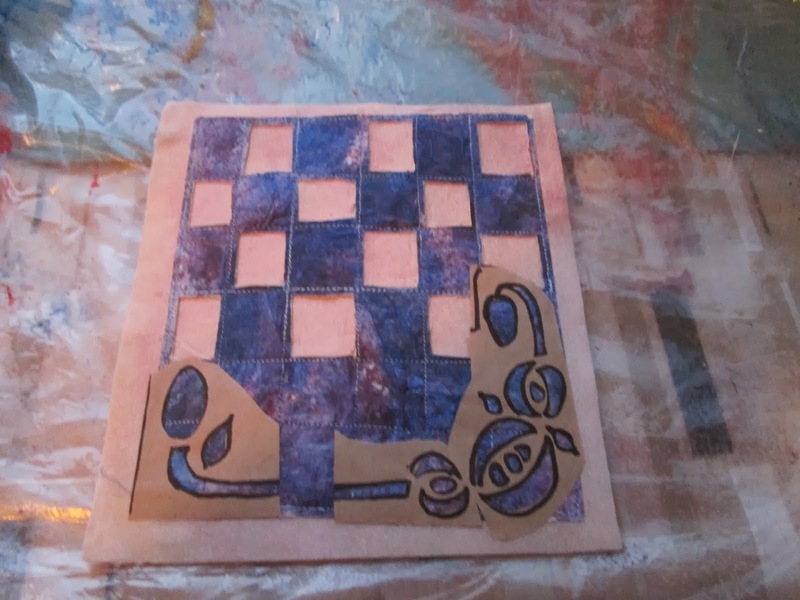 That said, I don't have enough batting to do such a large piece, so it will have to wait for now. 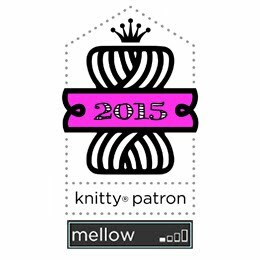 I recommend this book for those of you who aren't into designing your own knits, and/or are looking for colourful inspiration -- especially for what to do with those fun and funky yarns you might still have in your stash and which are making a bit of a come-back these days. 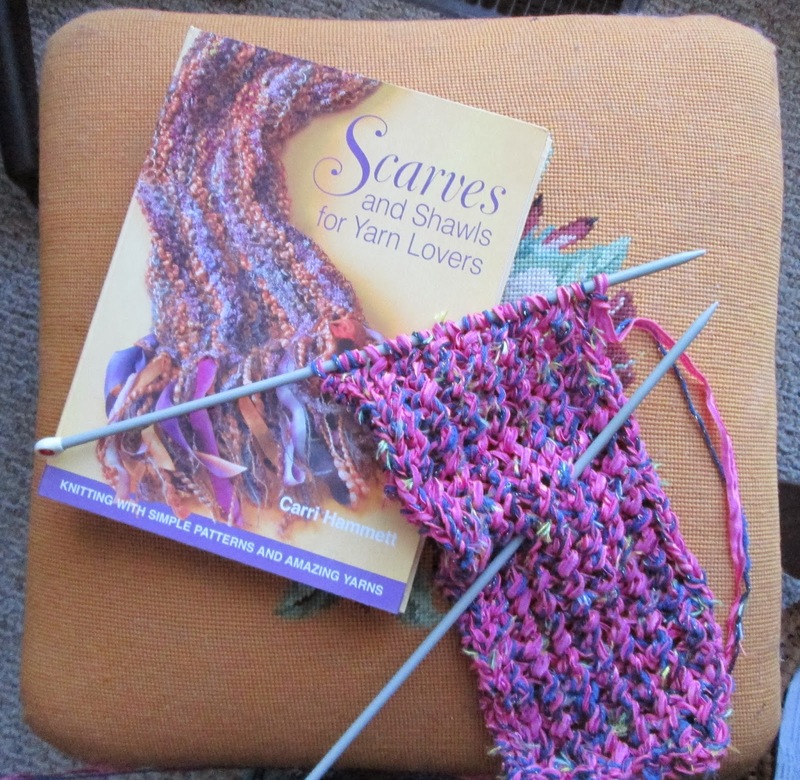 It's Scarves and Shawls for Yarn Lovers: Knitting with Simple Patterns and Amazing Yarns by Carri Hammett, Creative Publishing International, 2006. Mine is the hard-cover version, which has a spiral-bound spine so it lies flat when opened -- always a plus! Now...off to quilt! But before I go, I'm linking up with WIP Wednesday on The Needle and Thread Network -- because clearly, this week, I've got WIPs! Love what you are working on! 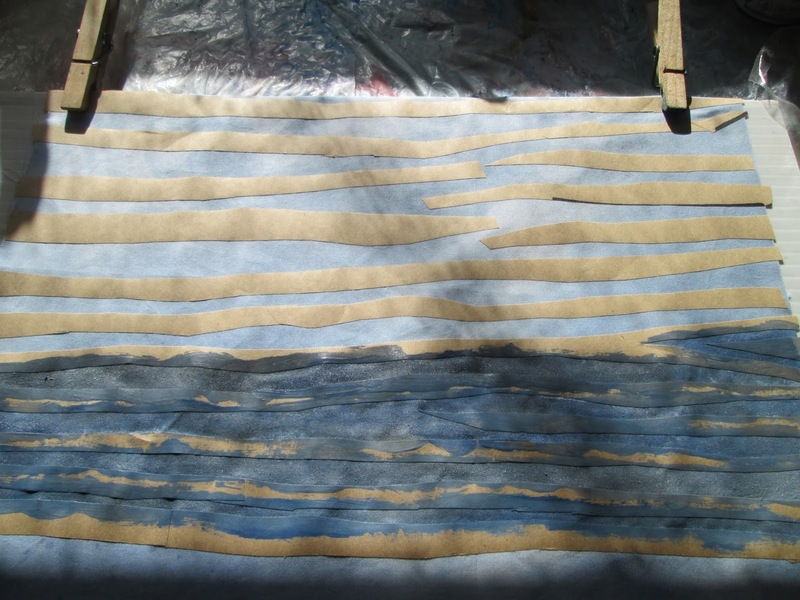 The paper fabric is an interesting process. Great scarf, too! A lot of very creative work, winter is not slowing you down! It would have been fun, following you around this week. I love Beryl's work and have only tried fabric paper in small projects. I've enjoyed working with it and really like how you've incorporated it. I'm also enjoying how your "A Walk in the Woods 11" is progressing. Great effect with the paint. I'm looking forward to seeing how these pieces of art, turn out. I love the lines of trees and shadows : ) You are working on so much, oh my!